Garson, G. D. (2013). Generalized Linear Models / Generalized Estimating Equations, 2013 Edition . Asheboro, NC: Statistical Associates Publishers. An introductory, graduate-level illustrated tutorial on generalized linear models and generalized estimating equations usuing SPSS. SAS, and Stata. 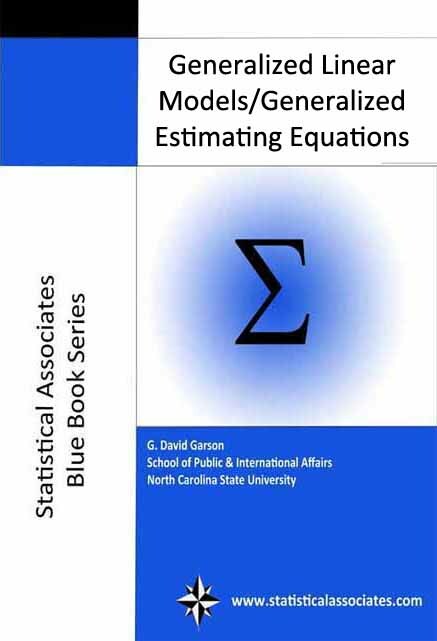 Covers linear regression, gamma regression, binary logistic regression, binary probit regression, Poisson regression, log-linear analysis, negative binomial regression, ordinal logistic regression, ordinal probit regression, complementary log-log regression, and other GZLM models. Also covers repeated measures linear regression, repeated measures binary logistic regression, and other GEE models. Why we think it's important: In addition to thorough coverage of an underused methodology which helps researchers pick the optimal type of regression, this volume explains why default output in SPSS, SAS, and Stata may well differ and lead researchers to different conclusions; and explains how to reconcile results.